I went to Fort De Soto on Easter Weekend with the hopes of capturing some migrant images. But North Beach is so beautiful that I couldn’t make the trip without spending at least a few hours with my toes in the sand. 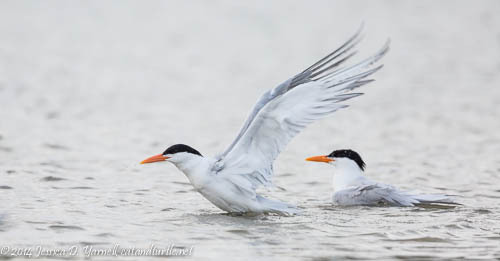 I never guessed that Royal Tern courtship was going to full in full swing, and I’d be at just the right place at just the right time! The morning was very cloudy, which was perfect, as it let me shoot into the sun (well, lack thereof) and photograph these great birds without getting wet. There was a flock of 20-30 birds, and they were all in the courtship mood. 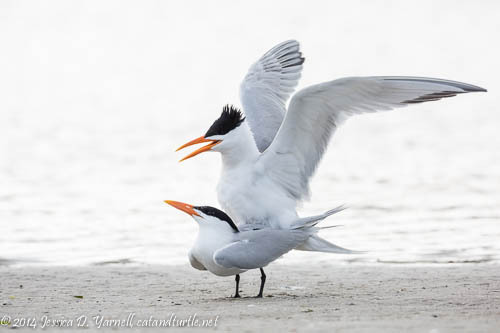 I’d never seen terns mating before. After seeing some great shots (Jim Gray’s Making Sandwiches comes to mind! ), I was itching to try for some of my own. Well, I got the opportunity! Quickly, too. 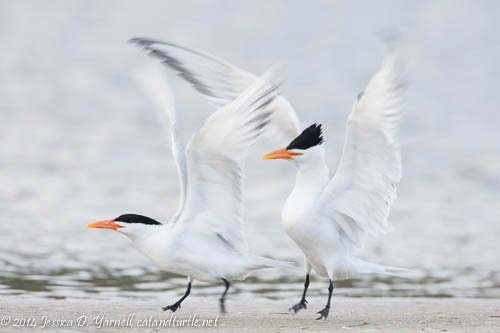 Very soon after I arrived, the first pair of terns was mating. 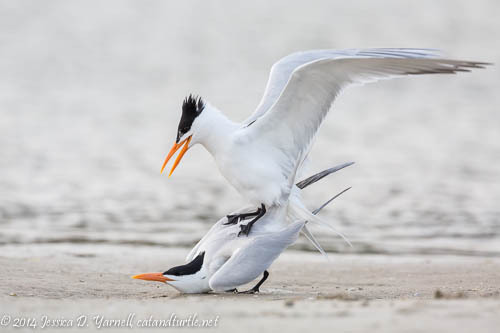 That’s when I learned something great about Royal Tern courtship. It isn’t fast! The male will often stand on the female’s back for several minutes, and the subsequent mating involves lots of wing-flap opportunities. Before I knew it, the second pair was mating. And the third. And the fourth. At one point we had three simultaneous pairs! Wow. It was fun to shoot. Each spring my mom asks me why I photograph that. It’s fun! Action shots! :) This year I’ve been doing more and more rear focus (where I focus with a button on the back of my camera, not the shutter button). It lets me pre-focus on the action and then shoot without the camera hunting for focus. That, and trying to not clip the wings, made this exercise all the more fun. I’ve written in the past how the juvenile birds beg for food. They are quite insistent. Long after they can feed themselves, they dance up to Mom with beaks wide open, begging for a morsel. Their nagging nuh-uh-nuh-uh calls are loud and annoying, and I always feel a little sorry for the adult birds. So it was fun to watch the adult courtship in the spring, and realize that it’s very similar! 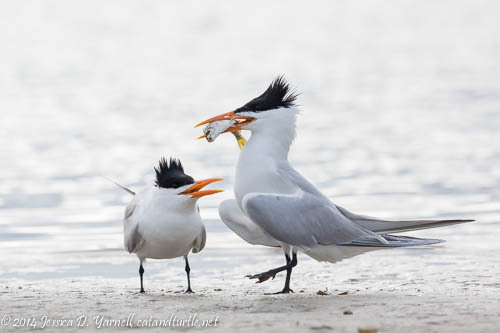 The male brings in a fish for the female, as a show of how well he can provide for her. She accepts a fish from the mate of her choice, then they often follow it with a piggy-back ride. In the video above, you can see the courtship behavior, with the female begging for a fish. Then below, the male has a fish to offer, but the female wasn’t too sure about his advances! Royal Babies on the Way! After the birds mate, they often headed for the water for a nice bath together. Birds will always do a wing-flap after they finish bathing, and this pair was no exception. I asked them to do a simultaneous wing-flap, but they were too busy being birds to cooperate. My favorite shot was after the sun finally came out. 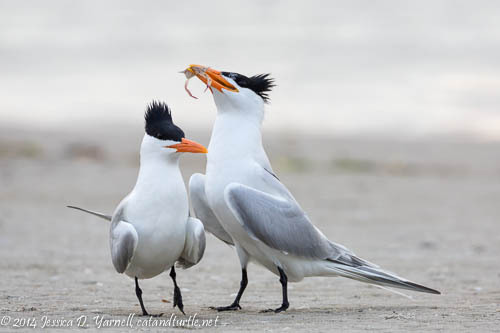 A male tern brought in a fish, and he had two or three prospective mates showing their interest in his mouthful. I don’t think he liked all the attention, though. He tried to fly off as his fish was grabbed away from him. I like the mid-air tussle for the fish. I wish I hadn’t had the teleconverter on – I clipped his wings! So it was an incredible morning at the North Beach, despite the lack of light. 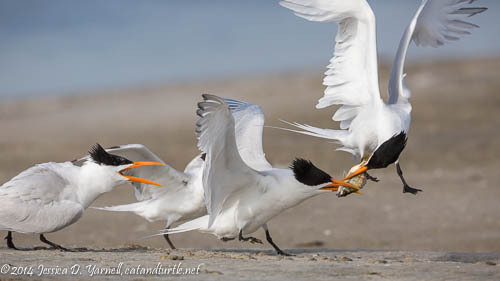 I returned a few days later hoping for similar antics, but the terns were nowhere to be found. I think they had moved off into the roped-off bird sanctuary. So I’m all the more appreciative that I had my fun on Easter weekend. Let’s see…3 blog posts so far from one day of shooting. And the ice cream has yet to be served??? I’d say that you had a pretty darn good day out there. Those are my favorite kinds of days! Great story and shots! See, we have the best birds over here. You guys need to come over more often.